for £5.99 postage paid . Rudolf Barshai’s cycle of the Shostakovich symphonies has been issued more than once, but the Symphony No. 4 to my knowledge has not been available separately until now. All of the performances were estimable, having been conducted by someone who knew the composer well and who premiered his Fourteenth Symphony. However as with most such cycles some of the interpretations stand out above others. One of these is this powerful account of the symphony here. The history of the Fourth Symphony is rather well known. Shostakovich began composing it while his opera Lady Macbeth of the Mtsensk District was being prepared for a new production at the Bolshoi Theatre, a production which Stalin himself attended. When an editorial in Pravda (purportedly by Stalin) denounced the opera two days after that performance, Shostakovich knew that his days were numbered if he didn’t toe the line. Thus, the symphony was not to see the light of day, though rehearsals of it took place. As James Murray points out in his excellent notes, “word of the work’s character must have leaked out to the Party at some stage.” The Symphony No. 4 did not receive its premiere until 1961 more than 25 years after the composer wrote it. It is easy to see why the symphony would not have been acceptable to the Stalinist doctrine of socialist realism. One wonders what direction Shostakovich would have taken had he felt able to continue along the path of this work. Instead, he redeemed himself with his Fifth Symphony as a response to “just criticism”. The Symphony No. 4 is a huge work in three movements that shows the composer at his most inventive. Two huge and rather unwieldy movements enclose a shorter scherzo which, with its formal structure, is typical of the composer’s later scherzo movements. However, the ticking percussion sounds that end the movement look forward to a similar device that Shostakovich wouldn’t use again until in some of his last works, for example, the Cello Concerto No. 2 and Fifteenth Symphony. The symphony begins with a scream in the high strings that captures something of the nightmare Shostakovich faced at the time. Later in the first movement the strings again play a ferocious fugato followed by six grinding dissonances by the whole orchestra. Murray likens these to Stalin’s “terror machine.” Yet one marvels at the very originality of this movement and it can be appreciated without any political context. The finale, like the first movement lasts nearly a half hour, and begins with a very Mahlerian funeral march. More than anything he composed earlier, Shostakovich’s debt to Mahler is most evident here. Later in the movement he lightens the mood with a divertimento featuring the winds, soloistically and in groups, before the timpani announce the beginning of a crescendo that builds into a huge climax by the brass underpinned by the pounding timpani. The symphony ends quietly and leaves a very unsettled impression with a “long throbbing pedal point”, as Murray aptly describes it. 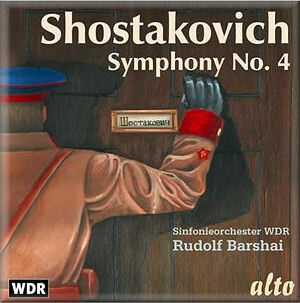 The Fourth Symphony, despite the inauspicious beginning of its performance history, has been lucky on disc in more recent years, beginning with Kyrill Kondrashin’s with the Moscow Philharmonic and Eugene Ormandy’s with the Philadelphia Orchestra in the early 1960s shortly after the work’s premiere. Those accounts represent interpretative opposites of the Russian vs. Western views of the work: Kondrashin’s the more exciting and Ormandy’s the more elegant. It may be overstating to say that only Russian conductors depict the terror lurking behind the notes of the score, but recorded history more or less bears that out. For comparison with Barshai, I listened to Neeme Järvi’s with the Scottish National Orchestra (Chandos) and Simon Rattle’s with the City of Birmingham Symphony (EMI). Though Järvi is not Russian, but Estonian, he still is able to get his Scots to really let loose. They produce as thrilling account of the symphony as any Russian orchestra. Rattle, on the other hand, is much more civilized — perhaps better played with a deeper sounding recording — but for my money too smooth. How does Barshai compare with these? He has an orchestra in the WDR Symphony that plays as well as the CBSO and has the Russian temperament to bring out all of the extremes in the piece. For example, the fugato passage in the first movement is every bit as exciting as Järvi’s as are the timpani during the climax in the last movement. Here Rattle’s timpani are just a blur under the brass and do not make the necessary impact. The wind soloists in all three recordings play with real character, but I especially like Järvi’s “mournful” bassoonist at the beginning of the finale. It is not a beautiful tone, as Barshai’s and Rattle’s are, but with minimal vibrato it really captures the funereal mood well. Overall, though, I would give the palm to Barshai who seems to have the best of both worlds: world-class playing and rich deep sound along with all the power one expects from this work. To further complicate matters, Vasily Petrenko in his cycle has yet to record the Fourth. Based on his earlier issues, that could change the picture.